Goldfish are omnivorous meaning they will eat any vegetable or animal based food. This page describes feeding goldfish that are past the fry (baby) stage, and the best Goldfish foods to use. Feeding fry is covered in detail here. You should also feed according to the season, and whether your goldfish are inside or in a pond. You must also consider the variety you are keeping, as fancy varieties often develop digestive and buoyancy problems if their diet lacks live food. Without doubt, goldfish fed exclusively on dry prepared foods will mean they won’t grow as fast, breed as easily, or develop the depth of color and other desired traits that goldfish fed live foods will. For more information about live foods go to the Goldfish Live Foods page. There are excellent dry foods available today, and there is nothing wrong with feeding them to goldfish…but not exclusively. They are sold as pellets, flakes, floating or sinking. Amazon.com have a good selection of the better brands such as Hartz Wardley, Hikari and Laguna. New Life Spectrum Goldfish Formula is another highly recommended pellet food. Floating foods are useful for pond fish because feeding time is the perfect opportunity to check for disease or other problems. When choosing which food to buy, look for those specifically made for goldfish. Check the expiry date, and if possible buy it from a store that is likely to have a high stock turnover as it is likely to be fresher. Once opened, keep the container cool and dry. If water accidentally gets into the food, throw it out immediately. Buy only enough food that will be eaten within 3 months, and discard what is left. You may have access to prepared foods such as trout pellets used in the culture of trout and salmon. The food usually comes in bulk packaging which makes it hard to keep fresh. Put large sacks in the freezer and take out small amounts as needed. All pellet foods swell once they are in water. It is advisable to soak them before feeding to your fish, especially if they show signs of discomfort or buoyancy problems shortly after feeding. For this reason I would always go smaller in pellet size rather than larger as the pellets will absorb water faster. It is out of season. In better pet shops frozen shrimp, daphnia, tubifex worms, bloodworms and mosquito larvae can be found year round. The food is usually frozen into cubes, similar to an ice cube tray but smaller. Another advantage of these frozen foods is the ability to break off only what you need and return the rest to the freezer. Don’t refreeze once they are thawed out as they start to deteriorate quickly, especially in summer. Freeze dried foods are more convenient because they can be stored without the need for freezing. Tests indicate freeze drying preserves the essential nutrients of the food. A problem with freeze dried foods is they contain absolutely no moisture. If gulped down quickly before having a chance to absorb any water, they will swell in the gut, causing discomfort or worse, constipation. Always pre-soak freeze dried foods before feeding to Goldfish. A growing trend is feeding ready mixed gel foods. These foods come in powder form, and are mixed with water. Little polluting of the water. Making up enough food for a few feeds only takes a few minutes, and it will store in a fridge for two weeks. I have now moved away from feeding any dry prepared foods to my Goldfish. I feed Repashy Soilent Green gel food or Repashy Super Gold Goldfish and Koi gel food for variety when not feeding daphnia and mosquito wrigglers. My fish love it, and this seems to be a common observation from other Goldfish keepers as well. 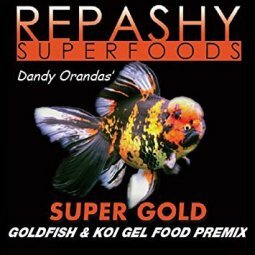 The worst thing about Repashy's is the smell after the mix is boiled, but I am prepared to put up with that because of all the benefits to my Goldfish. (There is little smell once the mix has gelled). Green plant matter should form a large part of the diet of a Goldfish. This is especially important if you are feeding your Goldfish dry pellet or flake foods as plant matter provides essential roughage that promotes good digestion. Some experts say Goldfish are more herbivorous than omnivorous but I have found given a choice they always eat live food first before eating vegetable matter. The vegetable matter source can be aquatic or green vegetable based. Water based options are just about any aquatic plant. There are few varieties that can resist their attack. The exceptions are listed on the Aquarium Plants page. Goldfish will attack aquarium plants more readily if they are being under-fed. Goldfish are particularly fond of Elodea Crispa or E. Canadensis, both commonly called oxygen weed. Floating plants such as duck weed are quickly consumed. During the summer months I often feed my fish blanket weed that takes hold in my daphnia ponds. The danger with feeding your fish aquatic plants is the possibility of introducing parasites such as lice or anchor worms, or pests such as snails into their environment so sterilize them first. Vegetables Goldfish eat range from kale, romaine lettuce, spinach, shelled green peas and broccoli. As the seasons change so should your goldfish feeding regime. Coming out of winter, the adults need a high protein diet of live food to stimulate egg and milt production. Cut back on the dry foods in favor of live foods. If you aren’t planning on breeding your goldfish feeding live food once a week is fine. Summer can be quite hard for goldfish because of the higher temperatures. Breeding should be over, so dry or gel foods supplemented with a weekly feed of live food will be all they need. In autumn, the adults are preparing for winter hibernation or a period of low activity. They need to build up fat for winter and next spring’s breeding. Feed them fairly heavily, similar to spring by cutting back on dry foods in favor of live. Feeding in winter depends on how low your water temperatures get. Live food, apart from earthworms, will be hard to find unless you live somewhere like Hawaii. Cut back on feeding as the fish show less interest in food as the water temperature drops. Dry or gel food will be adequate at this time of year if your fish show any interest at all. Goldfish are mainly bottom feeders, stirring up the bottom looking for worms and other insect larvae. For this reason you should only use gravel in your aquarium that is either too big for your goldfish to pick up, or too small for it to get caught in their mouths. Another consideration is the gravel shouldn't be so large that food falling to the bottom can't be retrieved by your fish. Sand isn’t really suitable and should only be used in marine aquariums. How Often To Feed and How Much? Myth: Goldfish can be over-fed. They can't, but you can feed too much poor quality food that quickly pollutes their water. Goldfish only have rudimentary stomachs, which is why you see them browsing for food throughout the day. Ideally they should be fed several times during the day, but this is impractical for most unless an automatic feeder is used. These feeders are best suited to dispensing dry foods. How much is fairly easy to work out. Measure out a small amount of food and feed it to your fish. See how quickly it is eaten. Repeat the exercise, (keeping a note of how many servings you have fed), until the fish start to lose interest. I would then reduce the amount by one serving at the next meal unless you are feeding for maximum growth. A more scientific approach is to weigh your fish, and then feed between 0.5 and 2% of its body weight at each feeding. To weigh a Goldfish, place a container of water on a set of electronic scales, and then switch them on. They should read zero weight having automatically compensated for the container of water. Transfer your fish to the container, and take note of its weight. If your goldfish is growing well, you should repeat this exercise every two months. Goldfish bought from a pet shop may have been on a starvation diet for some time, so their stomachs won't be able to handle a lot of food. Feed new arrivals a small amount and often until they settle in and start putting on some weight. Goldfish in outdoor ponds should be fed once a day from early spring until the end of autumn. Winter feeding will depend on how low your water temperatures get, but three times a week would be considered a maximum. Once temperatures reach under 10oC (50oF) Goldfish show little interest in feeding. Goldfish in indoor aquariums should be fed once a day from early spring until the end of autumn unless maximum growth is desired, then it should be twice daily. Because inside temperatures are generally higher for the human inhabitants, winter feeding can continue to be once a day, but with smaller servings.